As is usual in the case of siblings, I am terribly envious of my brother at present. This terrible jealous springs from the fact that he has snow and I don't. Residing in Bavaria, he has already been visited by the snow fairy this winter, whilst I have to put up with Lily-Rose's daily snow-vigil. No, it hasn't snowed overnight. No, it's not due to snow tonight. I love snow scenes, they appear to be utterly silent. When snow falls overnight, even in the city, you can tell before you look out of the window, because the sound changes. There is a muffled hush, as if a giant blanket has been spread over everything to comfort it. Usual traffic noise becomes muted and looking out, the world is transformed into something other, something magical. The lass in the picture above seems to be wondering at the change in her world. I think her home is behind her, up the slope, and she has ventured out in a very fine coat to look at the endless whiteness of the land around her. She is wrapped up from the top of her head to her feet, but her little face has a look of awe, possibly slightly afraid. The change is amazing and a sudden amount of snow always places our country (or the media of it) into an armageddon tail-spin. Queue panic buying of bread and the repeated headline that we are all doomed. Doomed! 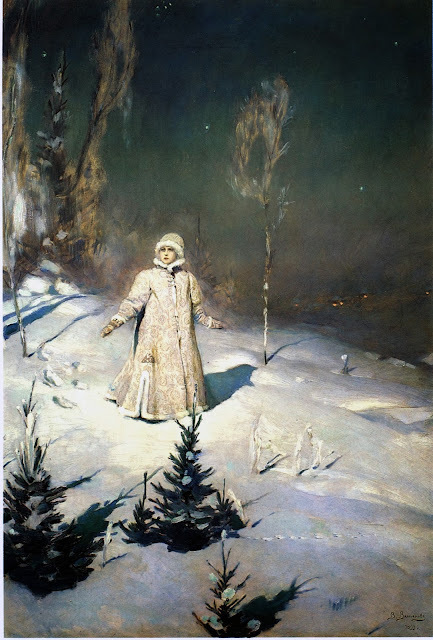 What if the Snow Maiden was the one who had brought the snow? She seems so small in the landscape, but maybe she is the one who caused the change? In Russian folk stories, The Snow Maiden, or Snegurochka, is the granddaughter of Father Christmas. In some versions of the fairy tales, she is the daughter of Spring and Frost and is unable to know love without melting. The Maiden walks alone in her landscape as she can only be alone or else she will perish. In some tales she plays games with children who dare each other to jump over their fire, and it ends badly. In other stories she falls in love with a shepherd, who warms her heart, which also ends badly. If we are being kind, we can interpret this as meaning she becomes a human who will one day die. Or you can envisage a puddle. Well, we've all been there. Keep warm, my friends, and remember if you are made of snow and someone suggests you play a game jumping over a fire, decline politely. Oh, and don't drink the mulled wine either. Blimey, it must be rubbish to be the mythical ice-granddaughter of Father Christmas. What a fantastically atmospheric painting. You can smell the frosty air. It's made me become all Christmassy, and it's my nearest and dearest's birthday too. Thank you for this beautiful image. I'm off to print it out. Don't drink the mulled wine? Is this from the same pen that seemed to be slightly squiffy on Christmas Cake Brandy Feeding last year??? If you are made of snow not even delicious mulled wine is worth dying for. Last time I checked, however, I was not made from snow. Mulled wine all round!